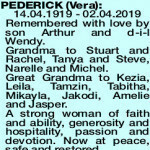 14.4.1919-2.4.2019 Daughter of Fred and Clarissa, Sister of Sylvia, Claude and Fred (all dec). Mother of Sylvia, Arthur, Roma and Julie. Wife of Horrie (dec). Mother of Sylvia. Grandma of Helen and Paul, Dawn, Christine and Tim, Robyn and Anil. Great Grandma to Simon and Larisa, Megan and Lance, Joel, Emily, Sam, Jake, Amy, Isaac, Sashi and Kiran. Great Great Grandma to Evelyn and Levi. Courageous, Strong, Challenging and at the end peaceful in adversity. Grateful thanks to the Carers and Residents at Waratah Lodge in Wagin. 1919 - 2019 Mother of Roma. Grandma of Pearl (Raelene), Lisa and Paul, Graham and Nancy. Much loved Grandmama of Alex. Your busy hands are at rest now. You have worked hard all your life. Thanks for the many skills we have learned from watching you. 12 days short of 100 years. Gone to be with your only love Horrie. Glad l was with you at the end. Sincere thanks to all Carers and Residents of Waratah Lodge in Wagin for love and care shown to Mum. 14.4.1919 - 2.4.2019 Loved Mother of Julie, Mother-in-law of Mark, "Grandma Farm" of Tim and Paul, and Christy and Zoe. Great Grandma to Hannah, Keira, Nathan, Ada and Lucy. Her life was a Bradman-like innings of hard work and determination. Back in the pavilion with Horrie, now at rest, just too worn out to reach the Century. A Memorial Service for the late Mrs Florence "Vera" Pederick of Wagin will be held in the Eric Farrow Pavilion, Wagin Showgrounds on S UNDAY 14th April 2019 commencing at 1.30pm. A Family Burial will take place on M ONDAY 15th April at 10:30am in the W AGIN Cemetery. 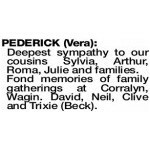 PEDERICK VERA 14.04.1919 - 02.04.2019 Remembered with love by son Arthur and d-i-l Wendy. 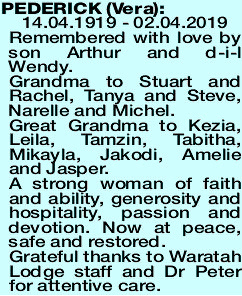 Grandma to Stuart and Rachel, Tanya and Steve, Narelle and Michel. Great Grandma to Kezia, Leila, Tamzin, Tabitha, Mikayla, Jakodi, Amelie and Jasper. A strong woman of faith and ability, generosity and hospitality, passion and devotion. Now at peace, safe and restored. Grateful thanks to Waratah Lodge staff and Dr Peter for attentive care. Deepest sympathy to our cousins Sylvia, Arthur, Roma, Julie and families. Fond memories of family gatherings at Corralyn, Wagin. David, Neil, Clive and Trixie (Beck).